Silver futures activity has been smothering silver prices, with the white metal trading down seven of the last eight weeks as it nears three-month lows. And not surprisingly, speculators have taken center stage in this protracted bear session, adding to their short positions for the fifth straight week. 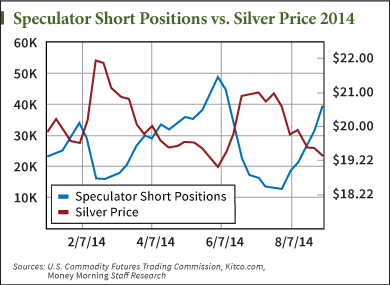 As of last Tuesday, speculators held 39,025 short contracts – paper bets on silver's decline – representing 195.1 million ounces of physical silver, according to the most recent data by the U.S. Commodity Futures Trading Commission. This was an increase from the week before, when speculators staked out 31,632 short positions, or 158.2 million ounces of silver, and it is the continuation of a buildup that began in late July when the number of contracts was at a low not reached since February 2013, at 12,603. This silver futures market activity is significant because this year the number of contracts and the movement of prices have had a very strong negative correlation. This means that as speculators take out more short contracts, prices will go down in a similar trend. And since July 29, this has been the case. Short contracts have grown by 26,422 contracts, and silver prices have fallen in that same time by 6.9%. While this is discouraging for silver bulls, there is a reason for optimism. That's because as sure as short contract buildup puts downward pressure on silver prices, liquidation of these contracts does the opposite. When speculators see silver headed near lows, they begin to move out of their short contracts because they understand that silver can only fall so far. This leads to liquidation of short contracts and fresh long buying on a large scale and has the potential to send silver prices into a long rally. This last happened in early June. At that time, silver short contracts were at their highest on record, hitting close to 49,000 positions, all while silver languished and traded below $19 an ounce. As speculators saw these lows, they reversed course, and over the next eight weeks as these traders sold off their short contracts and bought new long positions, the price of silver moved from $18.81 an ounce to $20.56, good for a 9% gain. And in this time, silver closed in on its 2014 highs, trading at one point as high as $21.45.